Deep in Eastern Europe, Bulgaria sits quietly, waiting to be discovered as a travel destination. Flirting with capitalistic success but still inextricably tied to a traditional farming lifestyle, the face of Bulgaria is in flux and the timely traveler will encounter a Bulgaria that is a new blend of both an old and new world. Bulgaria's popular destinations are mostly cities of varying degrees of prettiness along rivers of differing degrees of windiness. You'll most likely spend your time in Bulgaria touring different urban centers and the biggest and most popular city is Bulgaria's capital, Sofia. 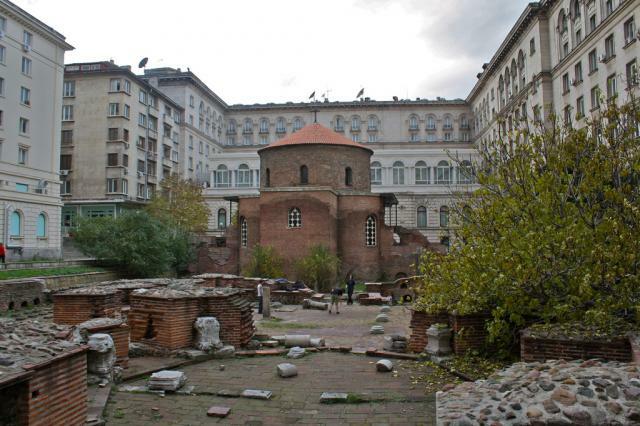 Sofia is full of museums, monuments, bars, dance clubs and parks. Basically everything you could want out of a European city. Although there are few world famous tourist attractions around, Sofia allows you to experience the city and daily lives of the people without a busy sightseeing schedule. Flights into Bulgaria mostly land at the Sofia International Airport, although there aren't that many flights each day. The best way to get to Bulgaria is to catch a plane to the major international hub of Vienna and drive down or take a train or bus from Austria. Once you're in Bulgaria, there is an extensive network of inter-city buses that are the best way to get around the country. In addition to being the cultural capital of the country, Sofia is also the home to the most and best accommodations in Bulgaria. There are plenty of hotels in Sofia and the coastal city of Varna, as well as hostels in Sofia, Varna and Veliko Turnovo.